Soutache embroidery’s origins date back to the fourteenth century in Eastern Europe, it is also referred to as Russia braid. It was initially used for making decorative elements sewn on military uniforms, it was used then to decorate the sumptuous dresses of the Tsars and Zarins, the colourful clothes of musicians and only in the last century this technique has been used to make wonderful jewels. The threads used to make a soutache come in many colours and are often made of fabrics such as silk, cotton, rayon, linen. These fibers are sewn together to wrap hard stones, beads and cabochons, which makes these creations really light and comfortable to wear, as well as being original and peculiar in their look. 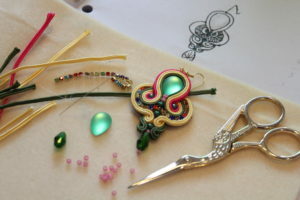 The creation of jewels using the soutache technique requires a lot of precision and patience in the execution, for this reason only few artists use it for their creations. In the last ten years this technique has taken a strong hold in Italy, thanks also to the great tradition of tailoring and fashion in this country, to such an extent that the soutache cords made in Italy are among the best ones on sale for their quality. Like any handcrafted item, the jewels made with the soutache tecnique will be unique and models will never be reproducible identically to each other and it is precisely this peculiarity that makes them even more precious. The models on the Vesuvio Jewelry page can be customized with different colours or beads according to your taste. The materials used by me in my models are: soutache cords made in Italy, beads, cabochons, swarosky crystals, faux leather or suede for the back cover and nickel free hooks. For more information on the processing of creations, their customization, costs and shipping methods, please contact me in private.